Strawberries have been in season for over a month now here in Italy and have been finding their way onto our menu quite a bit. From fresh, to strawberry sauce, to this delicious savoury and tangy Strawberry Risotto (Risotto alle Fragole). In fact, I’ve made it three times this past month. The first time I heard about this dish was at my in-laws a few years ago. Mamma (pronounced by accentuating the double mm, is hubby’s mom and not to be confused with mama (only one m), my Lebanese mom) was making it for hubby as it is one of his favourite dishes. Immediately, I exclaimed, “yum”, imagining a strawberry pudding dessert, but to my surprise it turned out to be a savoury primo (first course). I was a bit hesitant at first, and even after trying it I remained unsure about whether or not I liked it. It was good, but a bit unexpected. I’ve always imagined strawberries fresh with champagne or in a sweet dessert and it took some warming up to. Eventually, I got used to the idea and have grown to love it. The result is a savoury dish, with a very suttle hint of sweetness if you’re strawberries are nice and ripe and in season. The origins of this dish are not clear to me so I’m not sure which region of Italy claims ownership, but apparently it was born in the 70’s and there are many variations of it, with or without cheese, with or without cream, with or without wine or champagne, with or without balsamic glaze. In other words, a handful of this, that and the other thing and a pinch of salt for good measure. You’ll find “quanto basta” (qb) or “a piacere” used a lot in Italian recipes, meaning “as needed” and “to taste”, respectively. Thankfully I know my way around the kitchen and I’ve learned to make traditional Italian risotto, which I’ve adapted and veganized many times with various other ingredients. So this risotto recipe is very similar to the others, but with strawberries. Here’s a 10 Step Guide to the perfect Vegan Brown Rice Risotto, keeping in mind the traditional Italian Risotto recipe and steps and staying as true to the real thing as veganly possible. Since brown rice takes twice as long to cook compared to white rice, the process requires a bit of planning. Now the first time I made a brown rice risotto, it took me an hour and a half and the rice still wasn’t cooked perfectly. I’ve learned over time and the best results I’ve had involve par-boiling the brown rice first, which means adding the rice to a large pot of boiling water and letting it simmer on a low boil for about 20 minutes uncovered until it’s half-cooked (still firm and crunchy to the bite). Then you drain it and set it aside and proceed as you would for making regular white rice risotto. Once the rice is par-boiled and cooled, it should be dry toasted, separately from the soffritto, in a well heated pan on medium temperature for a few minutes. Toasting the rice is an essential step to allow the rice to absorb the liquid slowly without becoming mushy and soggy. Never toast the rice with the soffritto and be sure not to burn or brown the rice while toasting it. The “soffritto” (or sautéed vegetables) should be prepared with extremely finely diced onion, shallot or leeks. They should add flavour to the risotto without overpowering it and you shouldn’t notice their presence in the finished product. Since I don’t eat butter, I use a high quality extra virgin olive oil to sauté the onions, shallots or leeks. 4. Wine or Wine not? Although this is debatable for some Italians, wine is an optional ingredient, sometimes I add it sometimes I don’t. It depends on whether or not I have an open bottle kicking around and what kind of risotto I’m making. 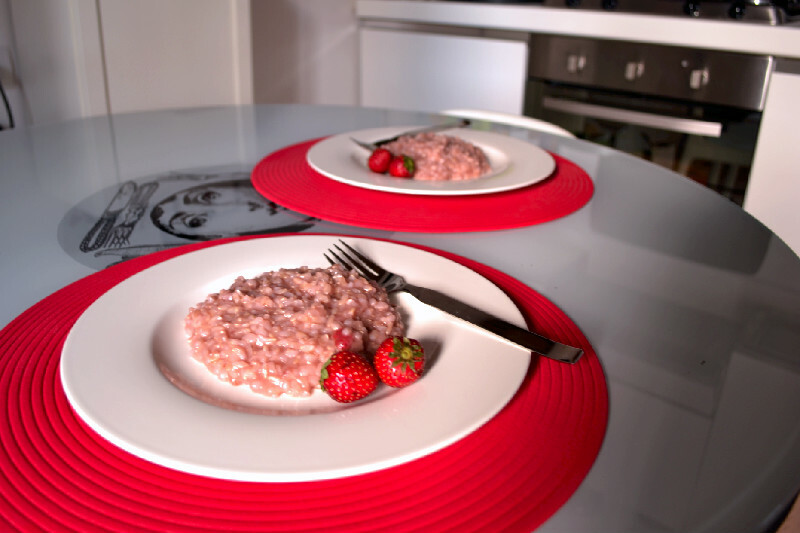 Wine adds flavour and acidity, so if you’re making a strawberry risotto for instance, it’s really not that important since strawberries have a natural acidity. Most of the time I do without the wine, but some people swear by it. Some recipes for Strawberry Risotto even call for champagne. I haven’t tried it, but I bet it’s delicious. If you do use it, you should add it at the beginning of the process, after you’ve toasted the rice and before you’ve added the broth. A good quality flavorful broth is important, but broth high in sodium content is less desirable. I prefer to make homemade vegetable broth. 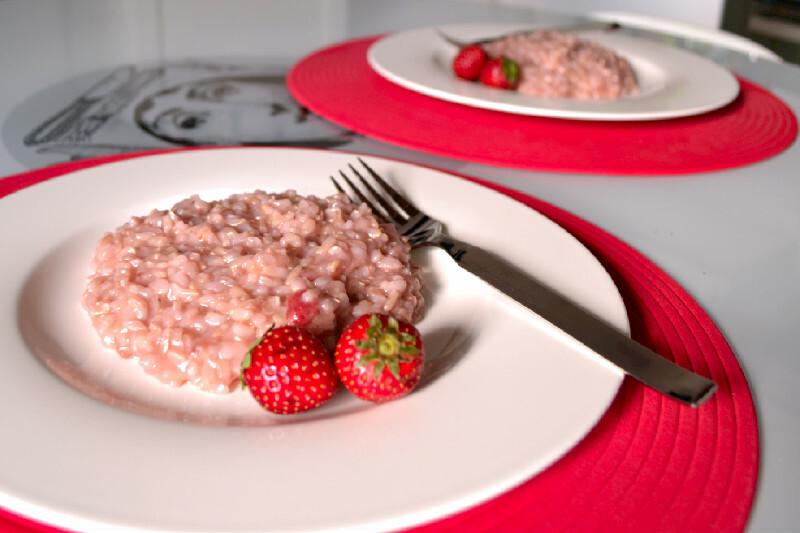 One of my favourite broths to use for this strawberry risotto is a simple delicate leek broth, made by boiling down a stalk of leeks, sliced into rounds, in 5-6 cups of water and a pinch of salt. You can also use low sodium store-bought broth if you like. I’ve done that as well and diluted it with water to make it more delicate for this recipe. The amount of broth is approximate and varies depending on the type of rice, the heat temperature, etc…The broth should be hot and should be kept hot throughout the entire process. I usually bring mine to a boil, then when it’s ready, I turn the heat down to the lowest possible temperature setting and leave on the burner during the risotto making process. While its important to stir the risotto from time to time, I personally don’t stand over it stirring the entire time. I first cover the risotto in broth, and stir it up, then I let if be for a while on medium-low heat until it has absorbed the broth somewhat. I then stir it up again and add more broth to barely cover it and let it evaporate again. I repeat this process until the risotto is well done, but the rice is still firm. I find that too much stirring results in a mushy rice. Cooking time varies depending on the type of rice, the pan, the temperature etc…but generally speaking it is approximately 30-40 minutes using par-boiled brown rice. I usually par-boil my rice while I’m chopping and preparing the other ingredients and the process takes about an hour. Risotto is typically “mantecato” or creamed with a dollop of butter and some grated Parmiggiano Reggiano or Grana Padano cheese, but if you ask me, this is not an essential step as risotto tastes just as great without it. If however you want to follow in the traditional footsteps of Italian nonne (grandmas), but you’re like me and don’t eat dairy, then you can use a vegan butter or better yet a homemade Almond Butter Cream (see recipe below). Risotto should be creamy, not runny or sticky. It shouldn’t clump together like a ball, and shouldn’t be swimming in liquid like a soup. It should make waves when you tilt the pan from side to side. Italians have an expression for this, it’s called “risotto all’onda”, onda meaning wave. Risotto should be served pipping hot and traditionally in a flat dinner plate and NOT a pasta bowl and with a fork and NOT a spoon. Italians are pretty serious about this stuff. Of course, if you serve the risotto in a pasta bowl nothing will happen and it will taste just as delicious. I felt a bit rushed taking pictures since this was our lunch one Saturday afternoon and Risotto has to be eaten straight out of the pan, so the photo-op time was very limited and I don’t have any close ups, but if you decide to give it a try, you’ll see it up close and personal for yourself which is even better. This recipe is inspired by Mamma’s recipe, but I’ve substituted brown Baldo rice for the white Super Fine Carnaroli that she uses and I’ve attempted to provide more accurate measurements than “quanto basta”. Prepare homemade broth or heat store-bought broth (preferably low sodium and diluted in water to lighten the flavour) in a pot and keep hot throughout the cooking process, as indicated in point 6 above. Heat oil in a wok or skillet over medium heat. Add finely diced shallots and a pinch of salt and sauté for 2-3 minutes. Add wine or champagne, if using, and let cook for 5 minutes to allow the alcohol to evaporate. Add sautéed onions to the toasted rice and mix to combine. Cover in broth (about 3 ladles), stir and let simmer on medium-low heat. Once broth has been partially absorbed, add another ladle of broth to just cover the rice, stir then let simmer. Repeat this step several times until rice is cooked, but still firm to the bite (al dente). In the final step, you can add a dollop of Almond Butter Cream to the risotto (optional) and a drizzle of balsamic glaze (optional) and stir it throughout before plating and serving. Place almonds and pine nuts in the food processor bowl and place it in the freezer for an hour. Remove from freezer, add oil and salt and blend on high speed for a few seconds until broken down. Add water, half a tablespoon at a time and continue to blend on high speed. You will have to scrape down the sides of the food processor every now and again as you gradually add water and continue blending on high speed until you have a creamy consistency resembling whipped butter. Yes it’s quite bizarre I agree…it took me a few tries to warm up to it cause I kept thinking it was odd that it wasn’t sweet….but it’s very tasty. You should try it.